Of course I appreciate the old OS as a computing artifact, but I didn’t expect to earnestly enjoy using it. I felt relaxed inside its rough pixels. It was low-fi without being staticky, minimal without being soulless. For real inner peace, I remember the original Mac OS, January 1984. Back in the day when User Interface Guidelines were created and followed. To this day I still miss the little Apple pull down menu on the upper left hand side. in a system that wasn’t supposed to be multitasking, yet we can’t open more than one sysprefpane at a time. And I agree about the User Interface Guidelines. For example, if you press control-eject to get the shut down dialog, the check box setting for “Reopen windows when logging back in” is remembered when changed even if you cancel the dialog. ??? I just clicked on the  on the left side of the Menu Bar and there still is a drop-down menu there. What EXACTLY is missing from it for you? I was just going to ask that. Did it go away in High Sierra? It had all your desk accessories in it, and you could tear off parts of it, rearrange and relocate them, and reattach them at will. It was neat and discreet, and could live at the bottom of the screen if you wanted it to. There wasn’t this big span bridge sitting there all the time. Yes. There was a design format that allowed us users to know how to use any program that was introduced on a Mac. Recently, (Mavericks through today), even legacy Apple programs have been reworked by programmers who never used a Mac in their life. Standard controls are either gone, or moved to inconvenient locations that disrupt creative flow. I remember there was a program called Growl that mimicked the annoying notifications informing you that your computer was doing this or that, popping up while you were writing, recording, editing, or anytime you were using your Mac. You know, like the latest versions of Mac OS. The thing about Growl was you could uninstall it and all the annoying crap went with it. Ahhh I’d have to see it again. I’ve been using Macs since 1987 but you know how it is when you haven’t seen something for years…. You know, like the latest versions of Mac OS. The thing about Growl was you could uninstall it and all the annoying crap went with it. The good news is that in all recent Mac OS versions, you can completely disable notifications and that will remove “all the annoying crap”, so in this case nothing’s been lost! I am going to guess that you don’t record audio and video of live events, edit and produce the resulting media on CD’s and DVD’s using GarageBand and iMovie? Right. Of course most current Mac users never worked in OS 9, let alone OS 7. There was a lot of grousing back in the day when OS X first came out and the Apple menu lost its familiar functions. Of course I’ve now had time to get used to the more limited selection of system operations in the Apple menu. For a while there were hacks that restored the Apple Menu on the right side of the screen. But these were eventually deprecated and disabled. If you are willing to take the time to build your own list of favorite folders, Default Folder X can add an item to the menu bar that will list them, along with recent files and recent folders. And, of course, it has a wide variety of Open and Close dialog features. The main reason the Apple Menu changed is that system organization changed and gradually became more complex; the old Apple Menu no longer applied. But that was little consolation to Apple Menu fans. 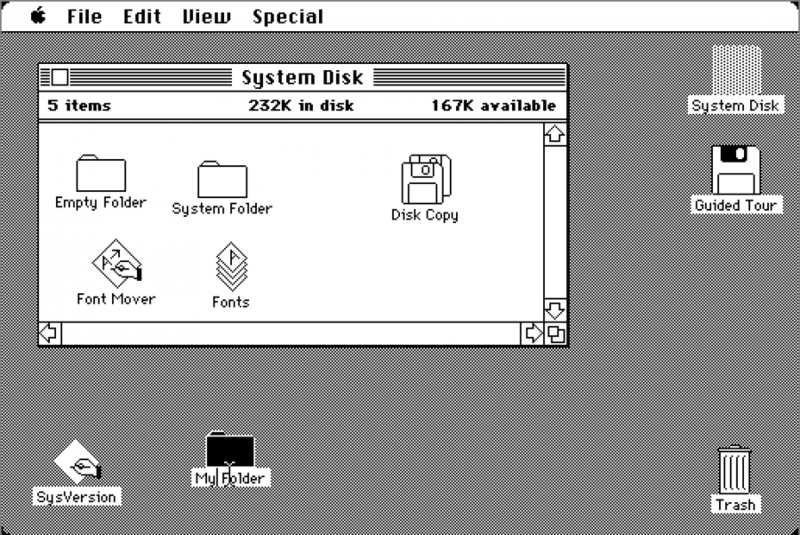 The old Apple Menu was not unlike the Start menu in Windows: It provided access to the entire system in one way or another. What we have now is the Finder window sidebar, which can be used to access our important stuff if properly organized. At a minimum you have your desktop, applications, documents, downloads and user folders, which can get you pretty much anywhere you want to go. Alternatively, you can put them in the Dock—some are there by default—if you want to access them without opening a window first. In short there are plenty of ways to get around the system even without the Apple Menu. Exactly. What once could be accomplished with one click now takes as many steps as windows. On the other hand, there are many things about OS 7 that I don’t miss. The Chooser in particular, which in the early days could not run your dot-matrix printer and 28k modem at the same time. There was no multi-tasking or multi-processing. The OS would choke if you didn’t manage your memory with an inch of its life. You had to quite one app before you started another. And even then the old app might not release memory the way it should and the system would freeze. This was usual, not unusual behavior. As for the black and white interface, that’s only restful in comparison to some of the fancier UI elements today (in fact the Mac OS returned to a more or less black and white interface when Lion banished color from much of the system). At the time the Mac OS was intimidating to just about anyone who wasn’t a programmer. Remember, computers were far less ubiquitous in 1991 than they are today. They intimidated people then every bit as much as they now. And, oh yes, the screen was all of 9 inches wide, on the diagonal. Still, life was simpler then and, generally, more labor intensive. Rotary telephones were still common. And, like the Model T, they came in any color you liked as long as it was black. Colored touch tone phones had begun to take over, but they still had long tangled cords to trip you up. Cars got eight or nine miles to the gallon of gas. TVs still mostly used antennas on the roof to bring in a grainy, red or green tinted color picture. Even black and white pictures were grainy and out of fucus much of the time. Mac OS 9 was great at the time. Now it’s little more than a toy. Maybe I’ve misunderstood what it is you were talking about. I was responding to the comment about Growl (which I loved back in the day before Apple introduced notifications). It provided notification bubbles in the top right of the screen. Apple has a similar built-in feature now, and these can be disabled, which removes the same things that uninstalling Growl did. What does this have to do with GarageBand and iMovie? Yes, I may have been too general in my description of notifications. The notifications that popup anywhere on Mac screens since Mavericks remind me of Growl. Growl didn’t last because Mac users didn’t want to be notified of every action the computer was taking. You see, people bought Apple stuff because the computer took care of computer stuff, “Magically”. The user simply wrote a book, produced an Oscar winning movie or mastered Grammy winning music, or made a fairly good amateur video that they uploaded to YouTube without having to do the things a smart computer was programmed to do. If creative people wanted to use windows computers, they hired a computer person to program the computer every time they wanted to use a computer for production. Apple eliminated that ‘extra step’ in the creative process by making a smart computer that would do ‘computer stuff’ while the producer created music and art through the interface. When this user wants to use GarageBand to record a live band using mixers and interfaces, the fancy new iMac computer using GarageBand doesn’t remember it has done this before, so it takes the focus away from music to instruct the computer how to record. If the computer is unsure, it will stop the process with a notification requiring the users attention. These kinds of notifications cannot be eliminated. I hope I wasn’t too long winded in my explanation, but I felt I needed to clarify. So if a HS user wants to turn off notifications, does he/she actually have to select no notifications from every single app in the list? There’s no global shut-up switch? I see there’s DND, but that wants a user to select times — not exactly a leave-me-alone-forever switch. So if a HS user wants to turn off notifications, does he/she actually have to select no notifications from every single app in the list? There’s no global-shut up switch? I see there’s DND, but that wants a user to select times — not exactly a leave-me-alone-forever switch. Well, I suppose you could DND from 12:00 am to 11:59 pm, but you can also just highlight each app in the pane in System Preferences and press delete to remove the app from Notification Center. You don’t have to select it, select no notifications, etc. but you can also just highlight each app in the pane in System Preferences and press delete to remove the app from Notification Center. How would you get notifications back for an app deleted that way from the list? than fiddling with the Do Not Disturb time as others have mentioned. design could partially be driven by some feature lacking in Notifications). I would say that a majority of Mac users do not understand what happens when they click on the green button in windows, as just an example. Or like yesterday I had a customer who had 270 spaces open totally unknown to her … very helpful … . Your description of life in the 1980s and 1990s had me rolling on the floor, laughing. I am presuming this is a fine piece of ironic observation. I’m just going to say that, having grown up in the 1960s and 1970s, that this is exactly what my parents said about when they were growing up. My generation benefited from some of the most startling and innovative technology advancements in that era—stuff that arguably ushered out the age of heavy industry as technological pinnacle. We had TouchTone® phones (and a palette of nine colors even when they were still rotary-dial); cable TV and HBO (though that needed its own separate decoder box); mobile telephones and the first “cellular telephones” in their little briefcases; cars that got decent fuel economy as long as you didn’t mind being crammed into a cheaply built econobox (but many people adopted them after the fuel shocks of 1973); and absolutely stellar and ubiquitous high-resolution color photography. The Apple II series captivated ordinary people in my opinion because, on the one hand, it resembled the colorful gaming displays of the late 1970s that had broken free from monochromatic “Pong”-like games and, on the other hand, could actually be controlled by the user with the English-like BASIC language. PEEKing and POKEing into memory locations on the machine could alter someone else’s software, or make yours better. I do think it’s wrong to consider Mac OS 9 or its predecessors “toys,” even by today’s standards. The modern MacOS is a solution to a different problem than the classic OS was addressing. OS 9 continued in use for scientists and technical applications for years beyond its proclaimed EOL. The difficulty with which it connects to the Internet is no handicap in those applications, and on fast hardware there is little maintenance overhead because the machine isn’t trying to keep up with outputting a pretty interface and dealing with notifications and “dialing home” whenever an app feels like it. I will say, though, that I absolutely do not miss needing a long curly tangled handset cord to carry on a phone conversation. I was only half kidding. I grew up in the 50s and 60s, a generation before you. I worked on computers in the early 70s and believe me they didn’t fit on your desktop, or any desktop. I had to punch my own cards to input a “program” that required complex Job Control Language to set up. Computer disk drives were roughly three feet across. And the tapes went round and round on drives over six feet high. If you had cable TV and an HBO decoder you lived in a rare and privileged household—though perhaps you were unaware of it at the time. And however you slice it, the picture was crap compared to today’s hi-def images, which have been around for hardly more than a decade. As for high-resolution color photography, sure, you could get it on a large format camera costing an arm and a leg. Not so much in 35mm. And certainly not from an Instamatic or Polaroid camera, the working-class cameras of the day. Early Macs may not have confused too many people, probably because not too many people had desktop computers of any kind. They were far less common then than they are today. If you run Mac OS 7 (in emulation, of course), it is certainly no more than a toy compared to recent versions of macOS 10. It was useful in its heyday, 25 years ago. Personally, I started out with Mac OS 7.5, on a Power PC Performa, and the picture was in 256 colors on my 9" monitor. I started out with Photoshop 2.5 and thought I was in hog heaven. But compared to Photoshop CC, or even Photoshop CS6, it was pretty basic. And Claris Works was a delight. Even Microsoft Word 5 was pretty good, 20-odd years ago. As for black and white, I run my iMac mostly in reversed screen mode, white on black, because all that while real estate on my 27" iMac is too much for my old eyes. I didn’t include Mac OS 9 with it’s predecessors because it wasn’t mentioned in the article, that I recall (nor was OS 8), which was, after all, about the Mac OS in black and white. OS 9 could support up to millions of colors on a Bondi Blue iMac, with more capable software, to boot, and some ten years along from OS 7. I maintain my point, therefore, that Mac OS 7 is a toy, a curiosity, nothing more, compared to the modern Mac OS. Though I’ve still got some floppy disks with an OS 7 installer, if you’re interested. You have ALWAYS been able to turn off notifications in the OS. Growl simply allowed apps that didn’t use system-based notifications to still use them (in a similar fashion). I grew up in the 50s and 60s too, and I’ve loved the posts about the pre-computer era in this thread. I entered the professional world in the mid 1970s and had a very different experience of how IBM, then Apple changed everything. Even before Macs began replacing IBM Selectric typewriters and early ACSII desktop PCs for document and graphic development and management, database, etc., two college students developed VisiCalc for Apple II. It instantly brought Apple into accounting, bookkeeping and financial services in companies from the smallest to the largest, except maybe IBM, who got blindsided. Until competitive spreadsheet applications were released 2-3 years later, Apple had a lock on spreadsheets, although Apple had no part in its development. It’s been theorized that Visicalc might have been what convinced Steve Jobs to shift his focus to developing revolutionary new software that would sell equally revolutionary hardware. Like with Mac and LaserWriter, the huge business expense was a very justifiable write off and profit building opportunity for any sized company. And people, no matter how high or low on the company totem pole, began buying Apple for their homes because they liked them at work when prices began coming down. Back in the day when User Interface Guidelines were created and followed. I wonder what gets followed these days. Is there a replacement for these once superb guidelines or is it just a committee of junior VPs that schmooze about what they like and by extension believe sells? I wonder how often things get decided based on “that’s not what people expect” which is of course code for “that’s not how it’s done on Windows”. Like the cmd-. discussion we’re having in the other thread. It’s as if cmd-. has to be replaced by esc these days because cmd-. has been around forever on the Mac (eons before iOS for sure), while it does not exist on Windows where esc is their default.